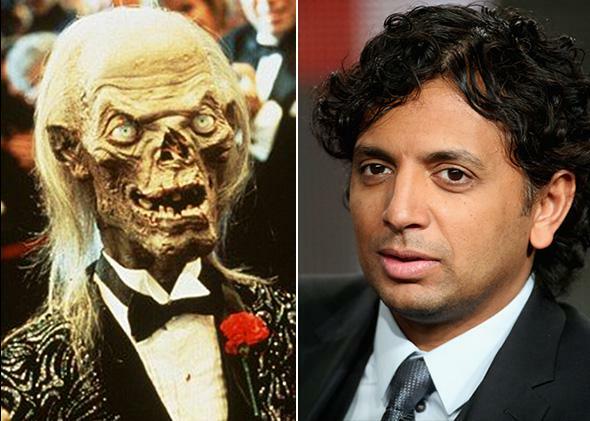 Tales From the Crypt revival on TNT finds perfect producer in M. Night Shyamalan. Fasten your drool cups, and ready your vomit bags! Tales From the Crypt is back. Television horror anthologies have a way of coming back from the dead, and now, Tales From the Crypt will finally join them. The giddy HBO series will get a reboot from M. Night Shyamalan, who will produce the new series (and direct at least one episode) for TNT. Hosted by a lovable, beady-eyed ghoul with an infectious cackle, Tales was one of HBO’s first big original hits and ran for 93 episodes beginning in 1989. It was helmed by directors like Tobe Hooper and Robert Zemeckis, with inspiration from the namesake EC Comics and 1972 movie. (It also had quite the revolving cast.) Recent years have not been kind to the horror anthology as a form—V/H/S: Viral, anyone?—so the prospect of the show’s return instantly had Danny Elfman’s unmistakable old theme ringing in my ears. But nostalgia aside, unlike some other revivals now banished from memory, there’s reason for hope this time around, thanks to an inspired hire in Shyamalan. Some fans greeted the news by glibly dismissing the series’ new chief (or with very original twist-ending jokes), but Shyamalan has more than proven himself the ideal steward for Tales From the Crypt in 2016. All of Shyamalan’s thrillers, even his duds, have been rich with horror heritage and homage, a clear sense of genre reverence that any Crypt adaptation demands. He ably brought small-screen atmospherics to Fox’s Wayward Pines, and then last fall’s feature The Visit showed that he’s shed many of his auteurist pretensions, revealing a delightfully grim prankster newly willing to get his hands dirty. In other words, Shyamalan takes his horror duties seriously, but he’s no longer above a nasty gross-out gag or two if he thinks it’ll make you squirm. If that doesn’t fit the job description for Tales From the Crypt, kiddies, I’m not sure what does. Admittedly, Crypt’s twisted fairy tales also call for an ironic wit that Shyamalan has never quite mustered, but the way I see it, there are two solutions to that problem: 1) He isn’t directing every episode (should we start suggesting names? ); and 2) There’s always the Crypt Keeper. Actually: Is there? This is a matter of some contention. In the HBO series, the Keeper—a wisecracking, punny skeleton with a fabulous wardrobe (actually John Kassir voicing Van Snowden’s lovely puppet)—anchored every episode with mood-setting bad jokes and funhouse glee. An inspired import from the EC Comics, this version of the Keeper was so indelible it spread to spinoffs, including an animated Saturday-morning cartoon and a Christmas album. But at the Television Critics Association panel where the series revival was announced, Slate’s June Thomas reports that TNT exec Kevin Reilly refused to say if the Keeper would return for Shyamalan’s show, even after he was asked repeatedly. He ominously hinted at “something very unique with audience participation.” The Keeper is part of the reason Tales From the Crypt has been so durable through its various iterations, the campfire-story vibe that suggests each dark tale has a grinning executor overseeing it back at home. The Keeper was a kind of cackling foil to Rod Serling’s phlegmatic Twilight Zone narrator, and without him, it’s hard to imagine this anthology would have risen above its many contemporaries to become genuinely iconic. Perhaps Reilly was mum because Shyamalan also plans to revive the Vault-Keeper and the Old Witch, the Keeper’s archrivals? Let’s just cross our gangly fingers that Shyamalan doesn’t take this new series as an invitation to bring back the stiff-shouldered genre auteur he locked in the basement. This guy isn’t Tales From the Crypt—and darlings, we all know cable TV has enough of that kind of thing already.